While Kevin Baez has become synonymous with the Ducks managerial role over the past eight years, he endeared himself to fans much earlier when he played for the orange and black. The former New York Mets infielder joined the Ducks in 2002 and proved to be a versatile option in the field. He would play second base, shortstop and third base during parts of four seasons in a Ducks uniform, though most of that time was spent at short. After playing 115 games during his first season with the Flock, Baez truly broke out in 2003. He compiled a .293 batting average and a .370 on-base percentage in 92 games that season and played well enough that the Cincinnati Reds purchased his contract during the year. Some of his signature moments with the Ducks came in 2004. He earned Atlantic League All-Star Game MVP honors that season (the final of three consecutive ALPB All-Star selections), connected for the sac fly during the famous August 9th game in Bridgeport that helped clinch the Ducks their first postseason berth ever, and was part of Long Island’s magical run to their first Atlantic League championship. After beginning the 2005 season as a player, he converted to a coaching role during the year. However, his legacy as a shortstop for the Ducks was cemented forever. Another former New York Mets infielder is also among the nominees for the shortstop position. After enjoying a 12-year Major League career, eight of which was spent in Flushing, Edgardo Alfonzo joined the Ducks for a pair of seasons in 2007 and 2008. He played 105 games with the Ducks during the first of those two years and hit .266 with five homers, 56 RBIs, 53 runs and 23 doubles. The performance with the Flock as well as in the Venezuelan Winter League helped “Fonzie” garner an opportunity with Tigres de Quintana Roo in the Mexican League to start 2008. Following a solid season south of the border, Alfonzo returned to Long Island and continued to sizzle. In 59 games with the Ducks to end ’08, he batted .329 with eight home runs, 27 RBIs, 76 hits, 13 doubles and a .395 on-base percentage. Alfonzo, who played all four infield positions with the Flock but spent most of his time at short, was also a superb defender, combining to make just 16 errors over his two seasons with Long Island. Not to mention, the Ducks earned postseason berths in both of those years as well. Although our third and final nominee does not have any Major League experience, he has played more games than any other player in franchise history. Dan Lyons has played 888 regular season games as a member of the Ducks, surpassing Ray Navarrete’s 863-game record this past season, a mark that had stood since he retired in 2013. The feat is even more admirable when you consider that Lyons first joined the Ducks in 2011 as a utility infielder on a team that would win more games than any other in the Atlantic League that year. However, “Shorty” greatly impressed during his 86 games that year, hitting .283 and posting a .971 fielding percentage. The Ducks made him their starting shortstop in 2012, and he proceeded to earn an Atlantic League All-Star Game selection. By season’s end, his spot in Ducks history was written in stone when he laid down a walk-off bunt single in the ninth inning of Game Five in the Atlantic League Championship Series to give the Ducks their first title since 2004. His performance in the series was worthy of earning Championship Series MVP honors. Since that point, Lyons has gone on to collect another Championship ring (2013), be named the first-ever winner of the Rawlings Gold Glove Defensive Player of the Year Award in the Atlantic League (2015) and garner two more All-Star Game nods (2015, 2016). Through eight seasons, he has totaled 40 homers, 353 RBIs, 423 runs and 755 hits. Not to mention, he has proven time and time again to be one of the top defenders in the league. The choices have been revealed, and the time is now to vote! Simply click the button below to head to the balloting page and select your choice for the 20th Anniversary Team’s shortstop. Vote as often as you’d like over the next week, but only one candidate can be chosen when you do. The winner, along with the remainder of the 20th Anniversary Team, will be unveiled at the beginning of the 2019 season! Be sure to check back again next week, as we’ll reveal our three nominees for the third base position. 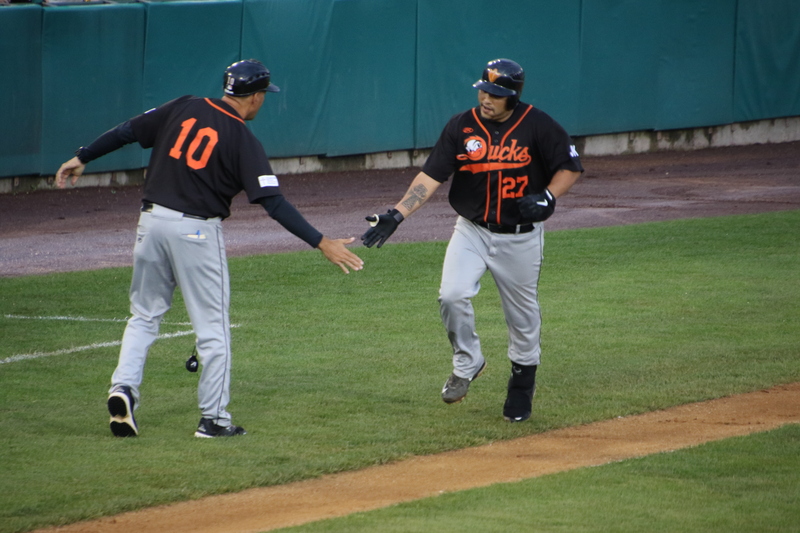 The Long Island Ducks and New Britain Bees open up a three-game series on Tuesday night. This will be the 16th of 18 scheduled meetings between the Ducks and Bees this season and the 56th all-time meeting between the two teams. The Bees have a one-game lead in the all-time series, ahead 28-27, but the Ducks have an 8-7 lead in 2018. The Ducks own a 16-10 record against the Bees at home and bring a 31-20 second half record to Tuesday’s game, sitting in first place in the Liberty Division by just one game. The Bees are seven and a half games back of the Ducks with a 23-27 second half record. The Ducks were able to salvage a game from the York Revolution, using early offense to win 7-3 in the finale. Back-to-back hits by Jordany Valdespin and Daniel Fields, along with a run-scoring wild pitch by Revolution starter Logan Williamson, gave the Ducks a 1-0 lead in the first inning. It stayed that way until the fourth inning when Long Island plated three runs to extend their lead to four. An RBI single by Dioner Navarro and a two-out, two-run double by Dan Lyons did the damage. An RBI ground rule double by Welington Dotel in the bottom of the fourth off Ducks starter Dennis O’Grady brought York to within three. However, Carlos Pimentel struck out two to leave the bases loaded in the inning. Then, a three-run fifth for the Flock put the game out of reach at 7-1. Sacrifice flies from Navarro and Cody Puckett, along with an RBI double by Miles Williams, highlighted the inning. York closed to within four in the seventh inning on a two-run single to right-center by Henry Castillo. Colton Murray came into the game though and struck out two of the three batters he faced to escape a two-on, no-out jam. York would get no closer, as Logan Ondrusek tossed a 1-2-3 eighth inning and Francisco Rodriguez pitched a scoreless ninth. O’Grady did not factor into the decision but lasted three and one-third innings, allowing a run on three hits and two walks while striking out three. Pimentel earned the win, tossing one and two-thirds scoreless innings, allowing just one walk while striking out two. Williamson suffered the loss, surrendering seven runs on 10 hits and a walk over four innings with two strikeouts. Brett Marshall will make his Ducks debut tonight after representing the piece that completed the Jason Creasy trade with the Blue Crabs. Marshall started his season with the Sugar Land Skeeters and Southern Maryland Blue Crabs, accumulating a 5-8 record with a 4.59 ERA with the two teams. The righty earned a win against the Sugar Land Skeeters on August 30th in his last outing, pitching six shutout innings to shutdown the league’s top team. The 28-year-old spent the first six seasons of his career in the New York Yankees organization, reaching the majors in 2013. Marshall collected a 4.50 ERA in three relief appearances with the Bronx Bombers, striking out seven batters. Atlantic League mainstay Kyle Simon will face the Ducks on Tuesday. The 6’6″ right-hander is 8-7 this season with a 4.10 ERA over 22 appearances (21 starts). Simon last appeared on August 30th, taking the loss against the York Revolution after allowing three runs in seven innings of work on six hits and one walk. After spending the first four seasons of his career in the Philadelphia Phillies and Baltimore Orioles organizations, reaching Triple-A Lehigh Valley in 2014, Simon has been an Atlantic League arm since 2015. Simon was named an All-Star in 2016 with the Bees, pitching to the tune of a 2.77 ERA over 120 and one-third innings. Fans can follow all the action for tonight’s game, and every Ducks game in 2018, on the Long Island Ducks Broadcast Network. Live streaming HD video and audio via BoxCast will be available on the team’s official Facebook page through Facebook Live, on the Ducks’ official YouTube channel and at LIDucks.com in the Ducks Video Center on the homepage. In addition to updates in this post, fans can follow a pitch-by-pitch account of tonight’s game via Pointstreak’s Game Live application by CLICKING HERE. BOT 1: Ducks plate two after an error and an RBI single by David Washington! It’s 2-0 early in this one! BOT 2: Ducks bring in three more after an RBI triple by Jordany Valdespin, an RBI double by Lew Ford and a base hit by Taylor Ard! It’s 5-0! TOP 6: Bees get their first run after a wild pitch to make it 5-1 Ducks. BOT 6: An RBI single by Cody Puckett extends the Ducks’ lead to 6-1! TOP 7: An RBI single brings in the Bees’ second run of the game. Ducks lead 6-2. FINAL: Ashur Tolliver strikes out a pair to solidify a 6-2 series-opening win for the Ducks! The Ducks look to make it four in a row tonight against the Road Warriors. Long Island comes in at 57-48 on the year, and 27-15 in the second half, three and a half games ahead of Somerset for first place in the Liberty Division, while the Road Warriors are 25-81, with a 8-35 second half record, seated at the bottom of the Liberty Division. This will be the 15th of 19 scheduled games between the two teams this season and their 123rd all-time meeting. The Ducks have dominated the series, winning 99 of 122 games, but have a slim 8-6 lead over the visitors this season. The Ducks put up a 17-1 record against the Road Warriors in their last year of action, 2011. The Ducks fought off a late push from the Road Warriors to win the series opener 6-4. 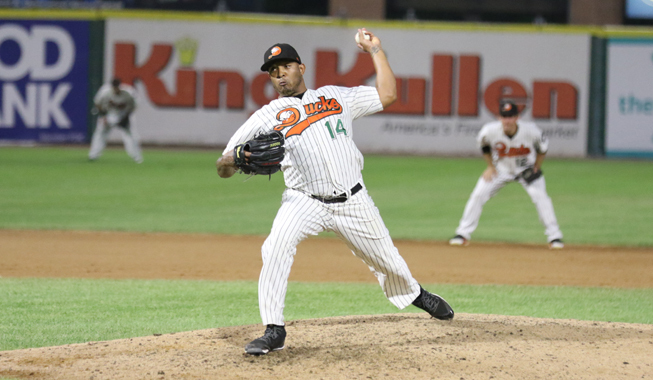 The Ducks jumped out to an early 4-0 lead against Road Warriors starter Alberto Rodriguez. Jordany Valdespin and Daniel Fields scored on a throwing error, a sac fly from Ramon Cabrera brought home Lew Ford and an RBI double by Miles Williams plated David Washington. The Road Warriors closed to within 4-3 with a run in the second and two in the third off Ducks starter Hector Silvestre. RBI singles by Ermindo Escobar and Melvin Rodriguez-Ortiz, as well as a sac fly from Jorge Fernandez-Diaz, did the damage. 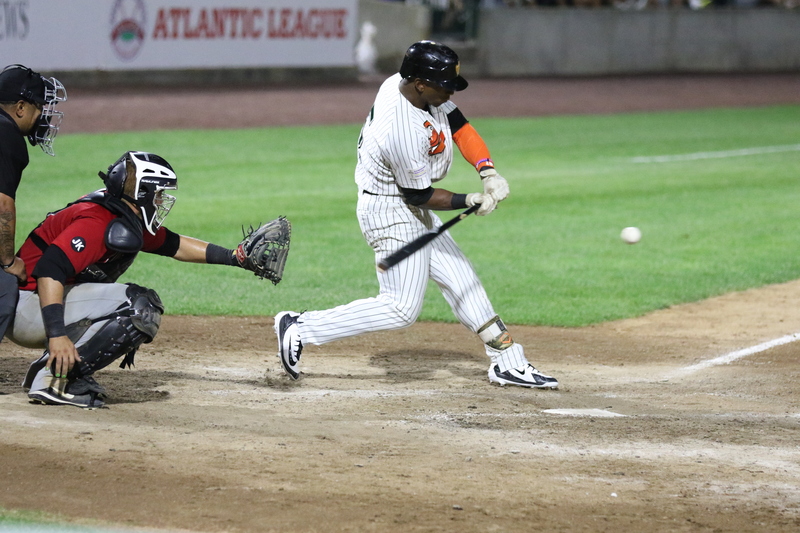 Gustavo Pierre then tied the game in the sixth with a solo home run to left. Long Island responded right away to take the lead, as a sac fly from Williams in the bottom of the sixth brought home Ford with the go-ahead run. Dan Lyons then capped the scoring in the seventh with a leadoff solo homer to left field. Silvestre picked up the win, tossing six innings, allowing four runs on 10 hits and a walk while striking out three. Rodriguez took the loss, conceding five runs (one earned) on six hits and three walks over six innings with seven strikeouts. Francisco Rodriguez earned his 24th save of the year with a scoreless ninth inning. Matt Larkins will look to win the rubber match tonight. The right-hander enters with a 6-4 record and a 4.29 ERA through 15 starts in 2018. Larkins is coming off a loss against the Bees in which he gave up six runs through six innings on nine hits, striking out five. Raul Rivera is back in the Atlantic League after pitching three games for the Skeeters in 2016. Rivera took the loss in his last start after giving up six runs in five innings on nine hits and three walks against the Lancaster Barnstormers. The Puerto Rican righty is 4-12 with a 4.63 ERA in 20 appearances (18 starts). Rivera spent the first six seasons of his career in the Houston Astros organization before playing in the American Association and Atlantic League. BOT 1: RBI singles by Taylor Ard and David Washington give the Ducks a 2-0 lead! BOT 3: David Washington launches his 21st home run over the left-field wall! Ducks lead 4-0! TOP 7: A run-scoring error cuts into the Ducks’ lead, it’s now 4-2 Long Island. FINAL: K-Rod converts his 25th save and the Ducks win 4-2! Five in a row! The Ducks look to make it four in a row tonight against the Road Warriors. Long Island comes in at 56-48 on the year, and 26-15 in the second half, three and a half games ahead of Somerset for first place in the Liberty Division, while the Road Warriors are 25-80, with a 8-34 second half record, seated at the bottom of the Liberty Division. This will be the 14th of 19 scheduled games between the two teams this season and their 122nd all-time meeting. The Ducks have dominated the series, winning 98 of 121 games, but have a slim 7-6 lead over the visitors this season. The Ducks put up a 17-1 record against the Road Warriors in their last year of action, 2011. The Long Island Ducks completed their fourth sweep of the second half with a pair of great wins in a doubleheader over the Southern Maryland Blue Crabs. The Blue Crabs struck first in game one when Cory Vaughn drove in a run with a sacrifice fly to center field in the second inning. The Ducks answered in the very next frame with a three-run homer off the bat of Taylor Ard to take a 3-1 lead. Dan Lyons added a three-run home run of his own in the sixth inning, and David Washington followed with a solo blast in the seventh inning. Ducks starter Chris Pike earned the win, throwing five innings of one-run ball, allowing five hits and striking out three. Craig Stem took the loss, giving up six runs on seven hits and three walks, adding nine strikeouts. Logan Ondrusek and Jose Cuas tallied scoreless innings of relief. Southern Maryland scored first again in game two, with Angelys Nina driving home a run with a base hit in the fourth inning off Ducks starter Lorenzo Barcelo. Like the first game, the Ducks answered right away as Dioner Navarro hit a two-run homer in the fifth inning to give Long Island the lead. Scoreless innings of relief from Carlos Pimentel, Ashur Tolliver, and Fernando Abad sealed the deal for the Flock. Pimentel earned the win, striking out the three batters he faced in the fifth inning. Tommy Shirley took the loss after surrendering the home run to Navarro during his two innings of work. Abad picked up his second save as a Duck, stranding the tying and winning runs in scoring position to secure the victory. Left-hander Hector Silvestre will start the series opener for the Ducks. The 25-year-old was excellent in his last outing, throwing six shutout innings against the Bees on Saturday in a 3-0 victory. Tonight will be Silvestre’s sixth start of the year (seventh appearance). Alberto Rodriguez starts for the second time this season against the Ducks. The Cuban has started five games for the Road Warriors this season, owning a 1-3 record with a 7.26 ERA. Rodriguez went seven innings against the Blue Crabs on August 19, allowing five runs (three earned) on 10 hits and two walks, striking out five in a losing effort. The righty spent the first two seasons of his career in the Royals organization before playing the American Association and the Sugar Land Skeeters last year, and starting this season in the Canadian-American Association. BOT 1: Ducks score four off an error, sacrifice fly, and an RBI double by Miles Williams! TOP 2: Road Warriors get one back after an RBI single. Ducks lead 4-1. TOP 3: Road Warriors pull within one, scoring two in the inning. Ducks hold a 4-3 lead. BOT 5: We are experiencing technical difficulties with our broadcast on Youtube and Facebook. Stay tuned for further updates. TOP 6: Our broadcast on Youtube and Facebook is back up and running! We apologize for the technical difficulties. TOP 6: A Gustavo Pierre home run has tied the game at four. BOT 6: Miles Williams gives the Ducks a 5-4 lead with a sacrifice fly to center! BOT 7: Dan Lyons hits one off the foul pole to push the Ducks ahead 6-4! FINAL: K-Rod converts his 24th save with a little help from Daniel Fields, who made a beautiful sliding grab for the final out of the game! Ducks win 6-4! The four-game series between the Long Island Ducks and York Revolution continues tonight. The Ducks enter the game at playing their best baseball of the season, winning 10 of their last 13 and taking a half-game lead in the Liberty Division at 19-11 in the second half. The Revolution are 15-15 in the second half, sitting in second place in the Freedom division, six games back of the Sugar Land Skeeters. York has a 7-6 lead in their 13 meetings this year and has a 4-2 edge at Bethpage Ballpark. The Ducks put up a five-spot in one inning last night, but it wasn’t enough to defeat the Revolution, falling 7-5. York took an early 2-0 lead on solo home runs by Alonzo Harris and Telvin Nash in the first and fourth innings, respectively, off Ducks starter Jake Fisher. Long Island answered back with five runs in the bottom of the fourth off Revolution starter Robert Carson to go ahead by three. An RBI double by Ramon Cabrera, a run-scoring single from Cody Puckett and a three-run homer to left field by Dan Lyons highlighted the inning. The Revolution closed to within 5-4 in the sixth on a run-scoring passed ball and an RBI groundout off the bat of Welington Dotel. A run-scoring wild pitch in the eighth plated pinch-runner Henry Castillo with the tying run. Two runs in the top of the ninth gave York the lead for good at 7-5. Michael Burgess’ leadoff solo homer to right and Melky Mesa’s sac fly to right did the damage. Neither starter factored into the decision. Fisher pitched six innings, giving up four runs (three earned) on six hits and two walks while striking out four. Carson lasted six innings, conceding five runs on eight hits and two walks with two strikeouts. Ricardo Gomez picked up the win after tossing a 1-2-3 eighth inning, striking out two. Francisco Rodriguez took the loss, yielding two runs (one earned) on two hits in one inning. Grant Sides earned his 13th save with a scoreless ninth. Tyler Badamo will start for the Ducks in the third game of the series. The Mount Sinai, N.Y., earned the win against the Somerset Patriots in his last start, allowing one unearned run in six innings on seven hits, striking out three. The righty has been with both the Skeeters and Bees this year, accumulating a record of 2-4 and an ERA of 4.81 in nine appearances (eight starts). With Long Island, he is 3-2 in six starts with a 3.08 ERA. Carl Brice will make his second start of the season tonight for the Revolution. The righty made his season debut on August 6 after signing with York three days prior. In the outing, the Mississippi native allowed four runs on six hits and two walks in just three and two-thirds innings of work. Brice has played in the Empire League, USPBL, and the Pecos League in the past. TOP 1: Melky Mesa sends one over the left-field wall to give York an early 1-0 lead. 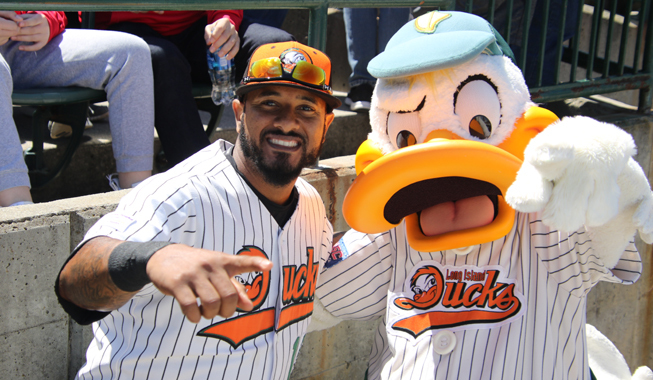 BOT 2: Ducks take a 2-1 lead after a solo shot by Ramon Cabrera and an RBI single by Jordany Valdespin! TOP 3: Tyler Badamo has found his groove, retiring seven in a row! Ducks ahead 2-1! BOT 3: David Washington extends the Ducks’ lead to 3-1 with a sacrifice fly! TOP 5: A two-run homer for York ties the game at three. BOT 8: Ducks jump ahead 5-4 after a two-run homer by Anthony Vega! FINAL: K-Rod retires the side one-two-three for his 21st save! Ducks win 5-4!